The hiatus has come and gone, and the world has become all too depressing in the last week. I don't talk politics on here, but suffice to say, I am deeply concerned right now. Anyway, as you may remember from before the hiatus, the boys got arrested for trying to kill the president. You know, the president as possessed by Lucifer. Can the Winchesters come save us? And now this week's episode... 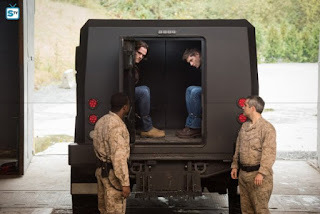 The brothers Winchester have been taken by some government spooks, put away in some high security prison place that appears to be off the map in one way or another. Their captors are intent on making them talk, but please. These guys have been tortured in literal Hell. We all know they're not going to talk. But how are they going to get out? That's a tough one, because Castiel and Mary have not a clue where they could be. Instead, they appear to be a bit aimless during the time that the boys are gone. Cas tries to hunt, but is terrible at it. Mary hunts, and is good at it. Yada yada. But, what's this? One day while delivering their food, a guard discovers that both Sam and Dean are *gasp* dead! They take them to the coroner and of course in a bit they pop back alive. They escape from the building really easily, even though you'd think there would be a bunch of cameras watching everything, but okay! They call up Cas for help, and ask him to meet them on Route 34... somewhere. That's descriptive! He calls up Mary to join in, but they both realize they're going to need more help when they have no idea where to pick them up, and no idea what they're walking into. In the end, they call up the British Men of Letters, who graciously agree to help. Did I say graciously? More like smugly. Anywayz, the boys are on in the wilds of Colorado and make some mention of something happening at midnight, but no time to talk about that now! They've got troops to outsmart! And outsmart them, they do. They wait until night to take them on, and quite swiftly take down the whole team. Don't worry, they don't kill any of them. 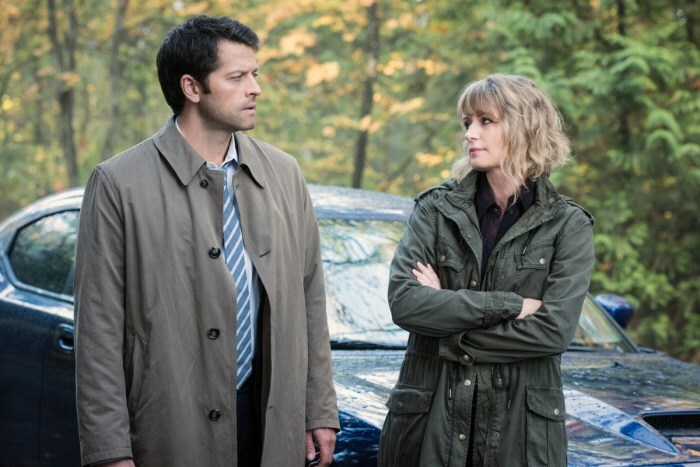 When they walk out of the woods - why Cas and Mary are there waiting, along with Mick and Mr. Ketch. The Brits think they've been sloppy, so you know that means they're going to go kill all of those people. Lovely. While driving their way out of there, the car sputters to a stop. Who should show up but Billie. Oh yes, the boys made a deal with her to make them appear dead for a bit to get them out of jail, and then one of them would go with her willingly at midnight. Or, you know, a Winchester. Because the wording is important, since Mary steps up and says she'll do it instead. Billie is ready to accept, but then Castiel steps in with an angel blade and stabs her. So now that works on Reapers as well? So many wavy rules. Basically, he doesn't want any Winchesters to die because he lurves them too much, oh and they happen to save people a whole lot. Just that. - Though the beginning was devoid of much emotion with the brothers, that Dean thinks the food is okay but Sam thinks it's gross is a small little nugget of fun. - As soon as they said a Winchester had to go, I said out loud "oh please you know it's going to be Mary." At least they twisted that a little bit. That would've been a stupid way for her to go. - Apparently it's Mr. Ketch, not Mr. Catch. Thanks, IMDB. Crowley: Sam and Dean, they're like Herpes. Just when you think they're gone, Hello! The boys are back. Dean: I've been better. I've been worse. Mary: Seatbelt on. I drive fast. Mick: You're surly, suspicious. You don't trust others. Castiel: Well that is accurate. Dean: We're not trapped out here with you. You're trapped out here with us. Sam: We're the guys who save the world. Yes, it was clear Mary was going to be the target at the end (writer's wise) but Dean wouldn't have asked Billie to make the deal for Mary or for Sam. He'd've gone himself. That was clearly the deal. Mary just jumped the gun. She's suicidal, as mentioned before in the ASA episode, so she's ready to lay down her life for her boys. Cas being bad at hunting is meh. He may be bad at flushing them out. He has no instinct about where Earth creatures go and what they do. So I guess I'll buy it up to a point. However, his attitude was very self-effacing, leaving me to conclude he's still dealing with his inferiority complex and PTSD which led him to say YES to Lucifer in the mid season 11 drama. He's at a loss without the Winchesters...? Well, he thinks he's useless, which is hogwash. Cas asking (asking??? is he kidding???) Crowley to help get the boys out, what? out of the goodness of his heart? Why didn't he put an angel blade to Crowley's throat and force him to push his people up the ranks in government to flush out where Sam and Dean were? Big mistake, Cas! He's just not been up to things this season. He needs a shrink to get out of his funk. And then he needs to beat Crowley to a pulp. Yeah the whole Cas thing felt a bit strange to me. I guess he's been having self esteem issues for a while but not being able to finish a hunting job felt a little like a stretch for his character. But apparently angel blades also kill reapers now, sooooo.... I guess anything goes, haha. I wasn't too thrilled, either, by Cas sucking at hunting. I think he's been proven to be more capable than that.